Some packaging companies specialize in particular areas, but broad, turnkey providers work in a variety of industries. From pharmaceutical clients requiring licensed packaging facilities, to high-volume customers in search of speed and economy; professional packagers address myriad needs. Within each category, packagers call on experience and prevailing industry standards to provide innovative solutions for diverse goods. And since consumers have different expectations, depending upon what they are buying, each packaging campaign has specific requirements. Jewelry, for example, requires special handling, because it is largely a luxury category. In a departure from packaging found lower on the retail value scale, successful jewelry marketing is more about quality and aesthetics than it is about sheer per-piece economy. In fact, non-jewelry gift sets promoted through health and beauty channels also reflect similar luxury appeal designed to lure discerning buyers. As the packaging industry continues to grow; kits, gift sets and jewelry packaging stand apart from other packages in several important ways. As you prepare to bring goods to market, consider the following thoughts about jewelry and gift assemblies. More than many other consumer products, jewelry evokes an emotional attachment among buyers. Jewelry’s luxurious nature stimulates a different kind of awareness among shoppers, which packagers must seize upon. In retail settings, jewelry packaging and other gift set assemblies lean on distinguished features to establish the emotional connection that spurs sales. Though committed to servicing all projects at a high level, contract packagers’ extra attention to detail is what sets memorable jewelry packaging apart. Packaging provides a valuable first impression, which must reflect jewelry buyers’ expectations. Experienced packagers make sure their designs stand out for all the right reasons, especially those conceived for vanity industries, like jewelry, fashion and gifts. In some cases, volume concerns do find their way into the jewelry packaging process. The Jewelry Network, for example, ships millions of gemstones annually, so effective packaging is essential to the company’s smooth operation. To meet demand, the network employs a highly automated system capable of packing items of various sizes. The system actually cradles the gemstones, suspending each jewel in protective laminate sheets, before the process seals the edges and locks them securely in place. There is no cookie-cutter solution available for packaging jewelry, gifts and other luxury items. Nor is each packaging need the same as the next. 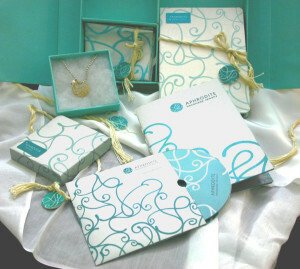 While inexpensive earrings and other costume jewelry are effectively merchandised using simple cards and paperboard displays, for instance, packages made for extravagant custom jewelry may require security enhancements and other unique features. Dunhill – The tobacco company’s Special Reserve Limited Edition Travel Retail Pack is comprised of a hinged outer box giving way to the perfectly positioned product inside. The gift presentation uses gold foil and exclusive wrapping techniques to add value to the box, and also incorporates embossed scroll-font text content to reinforce the luxury feel of the assembly. Lancôme – The winning Tresor perfume package includes an exclusive bottle and art-deco themed-design illustrating the retro trend seen in today’s luxury gift packaging industry. Accurist – The high-quality construction of the watch company’s slide-out box is immediately apparent. Though the watches are mid-level priced, the packaging elevates consumer perception, creating exclusivity. Modern packaging serves various marketing channels, from traditional brick and mortar retail stores to high-volume online shopping centers. To keep pace, the most successful packaging companies are prepared to respond with custom solutions, including gift sets and multi-piece assemblies. Gift sets create added value, because grouping multiple items in a single package makes shoppers feel like they are getting more for their money. The popularity of multi-piece kits extends beyond the fourth-quarter, though holiday themed gift sets account for a steady share of sales each year. Gift assemblies, kits and multi-packs are constructed using various materials, including shredded paper, custom wrap, foam inserts, filler material, molded components, graphic labels, chipboard cartons, and outer boxes for protection. Much like jewelry and other luxury items, gift sets with the most refined appearance get the most attention from shoppers. Kitting is another contract packaging specialty that bundles multiple pieces into a single unit. Though they are not always designed for the retail gift market, kits rely on some of the same materials and design features as gift assemblies do. Products like SVBSCRIPTION‘s recently launched series of personal kits for men illustrate the diversity of kits and gift sets, elevating multi-piece units into the prestige market. The custom service periodically sends unique assemblies to subscribers, each highlighting various items associated with a discerning lifestyle. Each “kit” requires a custom packaging solution that speaks directly to individual subscribers. Luxury packaging for jewelry, fragrances and gifts requires special attention to detail. In addition to high grade materials and quality construction, jewelry packaging and gift sets also lean on unique design features to attract discerning shoppers. Your turnkey packaging partner should be equipped to guide your project from start to finish, offering cutting edge options for meeting your jewelry and gift set packaging needs.